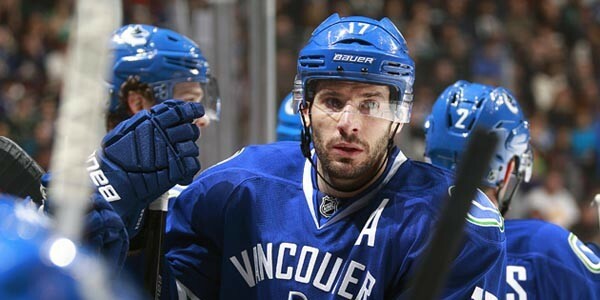 Ryan Kesler remains a Canuck as the trade deadline has come and gone. Time to accept the team we’ve got and move past the trade drama. The NHL trade deadline has come and gone, but you can’t say Canucks fans are clearer about the direction this team is going. Sure trade clouds are no longer looming over the dressing room, and the team you see now is the team you’ll see for the remainder of the season, but can you really see any better what bodes ahead for this group? Maybe the players can revert their attention back to playing hockey. Maybe they’ll actually string together a few wins and inch back up the standings. Maybe they can start scoring more than a goal a game. Or a goal a game. Or maybe they’ll just slowly fade into the sunset and wait until Canucks brass – whoever they are at that point – to make changes. It’s hard to believe that Roberto Luongo now dons the jersey of the Florida Panthers. Only 4 days ago, over 50,000 Canucks fans were chanting “We Want Lu”. But if you think about it, Lu’s last game as a Vancouver Canuck was almost a month ago before the Olympics when the Canucks faced the Leafs in Toronto. Regardless, this is Eddie Lack’s team now, and Jacob Markstrom will serve as his backup. How long until the inevitable Lack/Markstrom goalie controversy starts? Tonight’s opponents, the Dallas Stars, currently hold the 8th and final playoff spot in the Western Conference. But of course with 20 games left in the season, their hold on that spot is anything but final. The Canucks, the Winnipeg Jets and the Phoenix Coyotes are all within 2 points. It’s cliche to say, but every game, every point counts from here on out, especially if the Canucks have any ambition to make the postseason. It won’t help them though that they’ve gone 1-9-1 in the past 11 games. And neither will not having Daniel Sedin, who is out indefinitely with a leg injury, in the lineup and replacing him with Darren Archibald. The always charming Tim Thomas was traded to the Dallas Stars yesterday, but the Canucks will likely face Kari Lehtonen, who’s started 50+ games so far this season. The Canucks are welcoming some new faces of their own. Besides Markstrom, 6’4″ center Shawn Matthias will be playing his first game with the team, wearing Sergio Momesso’s old no. 27. If it makes anyone feel any better, Matthias bringing over a point-streak with 5 points in his last 2 games. For those wondering, the Canucks have 5 goals in their last 313 minutes of game time. Besides Dank, Mike Santorelli, Andrew Alberts and Yannick Weber remain out of the lineup. The Stars had been without Rich Peverley for the last 2 games because of an injury he sustained Monday night, but he may play tonight. True to a point; he was certainly playing well. Speaks to depth when the fate of your team lies in the hands of a guy signed to a two-way contract to be a 13th forward.